Hopefully this will be of interest for anyone who’s been as fascinated as I’ve been with the mural used on the ceiling of Josef’s office. 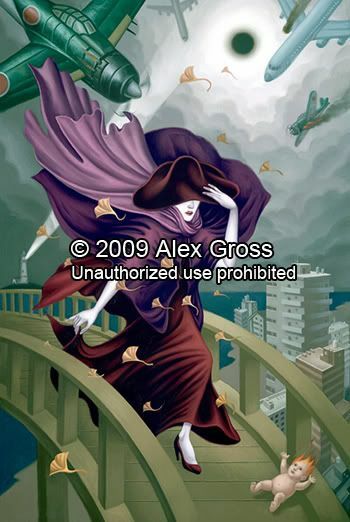 I’ve recently been in contact with Alex Gross, the artist responsible for the original painting “Matasaburo of the Wind” from which the mural was taken. 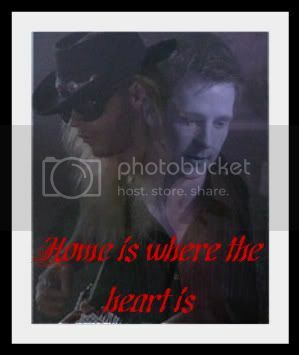 As a result of our conversation, Alex is considering making a limited edition print of the painting for Moonlight fans. The details would need be worked out depending on the level of interest, but it is expected that a fine art print of the painting would run somewhere between $100 and $250. I’m still waiting on word of the proposed size of the print. With his permission, I’ve put together a couple of questions and Alex’s answers from our correspondence. Lilly: I’ve become aware of your art through my interest in the television show “Moonlight.” Your amazing work, “Matasaburo of the Wind” was used quite impressively in the show as a ceiling mural in the office of a very wealthy and powerful character. I’m hoping you may be able to answer a couple of quick questions for me. First, is this piece available as a print? I’ve heard so much buzz among fans of the show about the dramatic mural. If it were available, I would love to be able to pass on that information to the folks on the “Moonlight” message board that I moderate. Personally, I would love to have one hanging in my home. Alex: Unfortunately I don’t have that piece available as a print. I'll consider making a special edition of it for the fans of the show. Lilly: How were you approached by the designers on the show for permission to use the painting? Were you involved at all in recreating the painting for television, or was it left up to the set designers to transfer your work to the set? Alex: Alfred Sole approached me to use the image for the show. I don't know exactly what his job was, but I think he was either the production designer, art director, or else working with them. They made a giant print from transparency film that I have. I don't know where they did this, but actually when they finished using the print, they sent it to me. I have it in the largest tube you could possibly imagine. I haven’t even opened it, because it's so large I couldn’t even unravel the piece in my house. For a viewer who wasn’t aware that the painting was created in 2001 – if they thought it was created specifically for the show – I think their interpretation of the images could be quite different from your original intention. For example, the pale female figure could be seen to represent a vampire. She is dressed in deep reds and purples, regal colors perhaps indicative of a position at the top of a hierarchy – as the vampires in “Moonlight” saw themselves. The bridge might be interpreted as a metaphor for crossing over from the mortal to the immortal realm. There are several aircraft of various vintage seen falling from the sky – perhaps a depiction of the many ages and follies of mankind that the vampire has witnessed throughout its long existence. The naked doll (baby?) in flames might allude to the vulnerability and the weakness of the human condition as seen through the vampire’s eyes, and the eclipsed sun could be a nod to the vampire’s aversion to sunlight. You get the idea. As an artist, does this sort of analysis bother you? Or, when viewers of your paintings take away things that you never intended, is it flattering, gratifying on some level, that your work has inspired this kind of contemplation and emotional response? Alex: I love hearing interpretations of my pieces, regardless of whether they correspond with my original intentions. The mystery about her pose and our inability to see her face creates an ambiguity that leaves great opportunities for people to try and figure out who she might be or represent. If I had said “she's a vampire” or “she's not a vampire,” it would really limit that and make it a lot less interesting for people who have read that to look at the painting. Usually my intentions relate to a mood more than any specific symbolism or meaning, and people almost always feel the same mood that I was trying to bring. So thanks for sharing your interpretation of the piece, I think it's wonderful! I didn’t even think about how perfect the eclipse is for a painting displayed by a vampire. I wonder if that's one reason the producers liked it. You can learn more about Alex Gross and his work by visiting his website: http://www.AlexGross.com. Although I will be passing on to him a summary of the response we receive here, if you are interested in his producing a limited edition print of “Matasaburo of the Wind,” please email him at alex@alexgross.com. An email expressing interest does not obligate you to purchase. It would also be helpful if you would use “Moonlight fan interested in a limited edition print” in your subject line. At this point he’s just trying to determine if there is enough interest to proceed. I also want to note here that if the print does become a reality, all sales and transactions will be handled by Alex himself. This forum and its management are in no way involved financially with this endeavor. ETA: 3/24: I just heard from Alex and the proposed size of a print would be approximately 20x30" or slightly smaller. Follow-up: As a result of our conversation and the interest expressed by those who emailed him, Alex has agreed to make a limited edition print of the painting for Moonlight fans. The print is now available at his website http://www.alexgross.com/store/prints/moonlight.html. The price of the print is $199 plus shipping and it is in a limited edition of 40 pieces, all signed and numbered by the artist. Thank you soo much for sharing this information, Lilly. This is fascinating. How nice of the artist to consider releasing prints for the fans..lovely of him. head:desk...okay, this is embarrassing, but I never noticed the mural before. I've always been too focused on the characters. (btw...you may want to leave that little bit out of your summary ) However, I had wondered about your avi, Lilly. Anyway...this is absolutely fascinating. Thanks, Lilly. The painting is so intriguing...and I love your interpretation of it. That is so awesome that he's considering the prints. What a wonderful conversation! I am delighted that he appreciated out interpretation of his work and that he would even consider doing a limited print run for us. I don't think I would know what to even ask. Thank you for being such a fantastic mod. Oh, My!! What an amazing opportunity for you, Lilly. Thank you so much for pursuing this and sharing it with us all. I've really been wondering about your avi Lilly. It is gorgeous. Thanks so much for this Lilly! I have always loved that mural and been fascinated by it, and would definitely be interested in a print if it becomes available. I'll e-mail him this week with my interest! If you look at some of the scenes in Josef's office, particularly when he's talking with Beth in FdL, you can see that the central figure from the ceiling mural, is also repeated on columns in the office walls. librarian_7 wrote: If you look at some of the scenes in Josef's office, particularly when he's talking with Beth in FdL, you can see that the central figure from the ceiling mural, is also repeated on columns in the office walls. Notice the figure off to the left. Thanks Lilly for posting all this. I loved the mural and wanted more information on it so I bought a book of Mr. Gross's art. Quite interesting. I'd love a poster and will be emailing him. I always thought it was quite unusual for a set designer to add something like this into a TV set. But then Josef is quite unusual. I loooove Josef's office. And I repeat...how the heck did I miss this mural?! *looks at pic again and sees Mick* Oh, that's how. thanks so much for posting this Lilly. I'd never paid that much attention to the paintings (too much eye candy!). 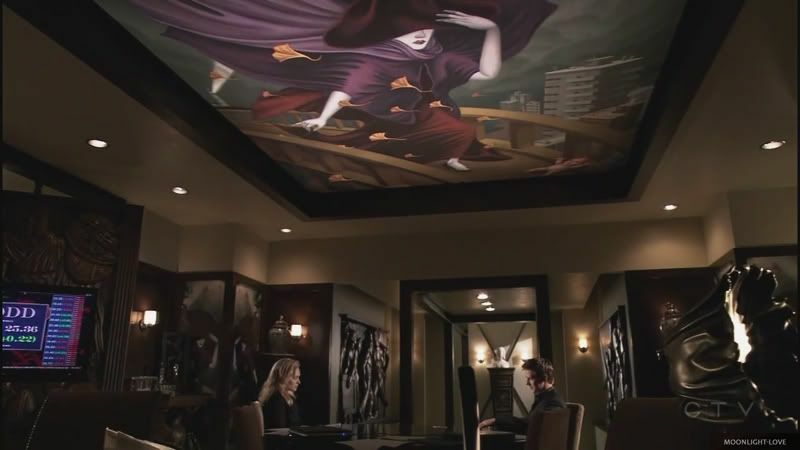 The mural is mysterious and beautiful and your analysis of the work from a 'vampire' perspective was stunning. She actually does look very vampiric, with her pale pale skin and red lips (and of course being covered up against the sunlight). I'll definitely be looking at more of his work. Lilly, this is a really amazing thing you've done; thank you very, very much. The painting is lovely, and it expanded into a gorgeous mural. I loved reading his responses to your interesting questions...especially his answer to your fascinating interpretation of the images in the painting. Do you know the original dimensions of the piece, and what medium he used? That is so cool! I've always liked that mural, so it's great to learn the history behind it. Josef's office was so impressive -- I can understand why he was taking so long designing another one! allegrita wrote: Do you know the original dimensions of the piece, and what medium he used? The original, which was painted in 2001, was done in oil on canvas and was 40"x30".